Robert Seymour was a well-known illustrator prior to his association with Charles Dickens. At the time, illustrations were often the focus of a book with text being created to support the art. In this model, the balance of power in the creative endeavor rested with the artist. In 1835, Seymour got the idea for a series of comic hunting sketches. He approached Chapman and Hall with his idea, and they started looking for an author to provide accompanying text. Seymour had every expectation that this publishing experience would be similar to all his previous publications in which he drew what he wanted and the author added text to match. Although a relatively unknown author, Dickens was gaining attention for his sketches of London life that would be published as Sketches by Boz, with illustrations by George Cruikshank. From the start, Dickens took control of the project, shifting the focus from the pictures to the text. Seymour had suffered from bouts of mental illness his whole life. 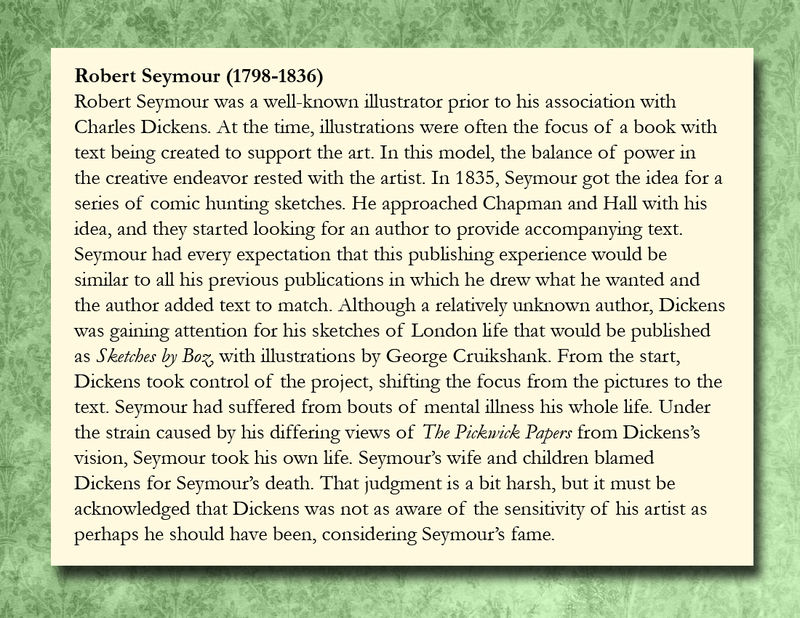 Under the strain caused by his differing views of The Pickwick Papers from Dickens’s vision, Seymour took his own life. Seymour’s wife and children blamed Dickens for Seymour’s death. That judgment is a bit harsh, but it must be acknowledged that Dickens was not as aware of the sensitivity of his artist as perhaps he should have been, considering Seymour’s fame. Pickwick Papers. Mr. Pickwick addresses the Club. Robert Seymour. Mens’ clubs were a popular institution in Victorian England. 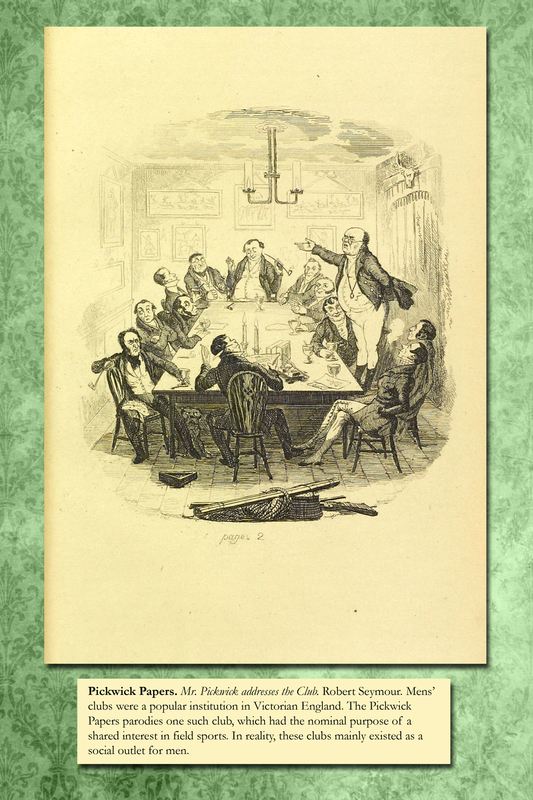 The Pickwick Papers parodies one such club, which had the nominal purpose of a shared interest in field sports. In reality, these clubs mainly existed as a social outlet for men.